PHOTO, L to R: Pam Bishop, SMIF; Melissa Kjolsing, MN Cup; Dave Jonas, Board Chair of Red Wing Ignite; Susan Sorensen Langer, Live.Give.Save. April 25, Red Wing, MINN. – On Tuesday, April 18, four southern Minnesota entrepreneurs pitched their businesses to judges at the second annual Ignite Cup business competition. The winner, Susan Sorensen Langer, founder of Live.Give.Save., will go on to be an automatic semi-finalist at Minnesota Cup, the nation’s largest startup business competition. Live.Give. Save. is located in Red Wing and is a member of Red Wing Ignite. The Ignite Cup is a way to encourage southern Minnesota entrepreneurs to take the next step. It is a collaboration of community builders, including Red Wing Ignite, Mayo Clinic Business Accelerator, Minnesota Department of Employment and Economic Development (DEED) and Southern Minnesota Initiative Foundation (SMIF). “The Ignite Cup is a wonderful example of how Southern Minnesota communities work together. There is a lot of talent within our communities. The Ignite Cup exists to highlight these entrepreneurs,” said Neela Mollgaard, executive director at Red Wing Ignite and an organizer of the Ignite Cup. Live.Give.Save. calls itself the “FitBit® of personal finance.” Its mobile-first technology enables people to spend wisely, save for a secure future and help others in need without changing behavior. Live.Give.Save seeks to address the problem that 62 percent of Americans don’t have an emergency savings for $1,000 hospital visit or $500 car repair and the 50 percent of Americans not saving for retirement. “Winning the Ignite Cup, earning a spot as a semi-finalist at the prized MN Cup, blew a big burst of wind in our sails,” said Langer, founder of Live.Give.Save. “The exposure alone is immense. Much like Shark Tank, just being a presenter (at MN Cup) offers tremendous opportunity to connect with much-needed resources. 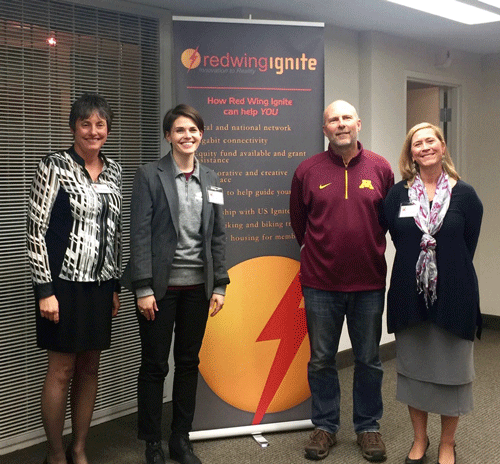 Being part of Red Wing Ignite in 2015 was the best business decision I made." Other businesses participating were Thaddeus Medical Systems, How to Babysit and Rad-Path. All were encouraged to apply for Minnesota Cup. Minnesota Cup awards will be held October 12. For more information on Red Wing Ignite Cup, contact Neela Mollgaard at neela@redwingignite.org or 651-327-2115. Red Wing Ignite is a community-funded innovation center. It provides a place where creative individuals can build their ideas. Red Wing Ignite enables entrepreneurship and technological innovation for the Red Wing community by offering collaborative space for co-working space and private offices, events to learn and connect, resources for all stages of businesses, regional and national networks, and gigabit Internet access. By bringing together like-minded entrepreneurs, investors and advisors, it creates a unique ecosystem for the Red Wing community to share ideas, resources, and expertise. This ecosystem, in turn, promotes local and regional economic development through new company creation and expansion. For more information, visit Red Wing Ignite’s on website or check them out on Facebook or Twitter.